Flower Frogs - What Are They, and Why You Want Them. Flower Frogs – What Are They, and Why You Want Them. Learn about flower frogs, their history and how you can use them in your home. They are so fun to collect and really work well when creating centerpieces. While recently visiting my friend Lisa’s house, I was reminded of her beautiful collection of flower frogs. You see, Lisa has the most beautiful home, filled with all kinds of antiques, many which are gardening related antique collectibles. One of her collections, floral frogs, has often interested me, so I asked her if I could borrow some and write about them on my blog. Being the ever gracious person that she is, the answer was a quick “yes,” followed by a show-and-tell of some of her favorites and a box for me to take home and play with. What is a Flower Frog? Never heard of flower frogs? Well, maybe you’ve seen them but did not know what they were. Flower frogs date back to 14th century Japan as a means of assisting florists with flower arranging. 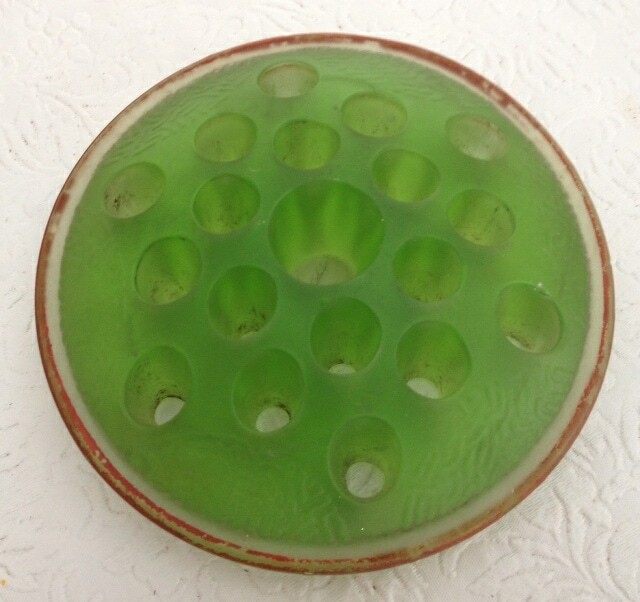 They come in a variety of forms, including glass, ceramic and metal. Most are used inside of vases to hold the flowers in place. Some are not used in vases but come with their own containers to hold the water and, even more interestingly, some are beautiful ceramic figurines with holes to hold flowers as an art form. It seems that no one knows the origin of the term “frog,” though most agree it must have become a slang term for the fact that they sit in water, like a frog. Flower frogs became widely popular in the US during the 1920s and ’30s. In the mid-1950s, however, a water-absorbent foam, called “Oasis,” was invented, driving the flower frogs to near extinction. Still, many people, like Lisa, enjoy collecting them and displaying them for their own beauty or re-purposing them for other uses. Here’s an all-in-one glass frog holding a tight set of daisies. Somewhat like the Pave arrangements that are very popular now. Imagine how cute they would look if you had several of them running down the middle of a long dining table. I think they would also look nice in antique teacups. Here’s a great example of their basic function. 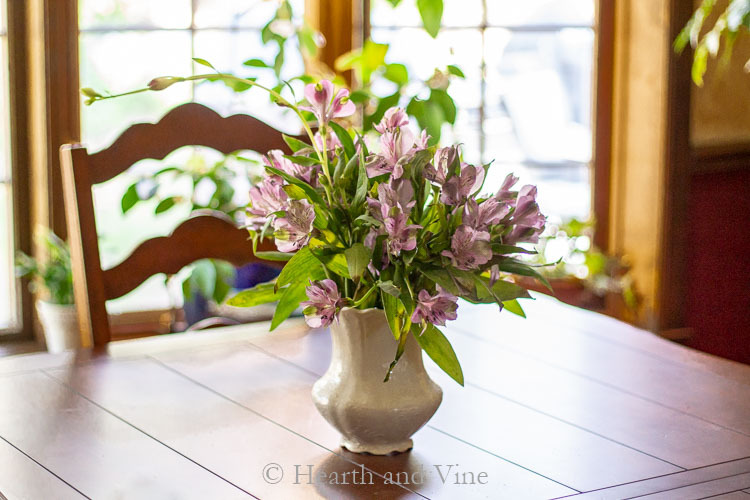 I used the same clear glass flower frog pictured above in the vase to hold this little bunch of alstroemeria in place. There weren’t many stems in the bunch but it looks really pretty and full. They make flower arranging so simple. Do you own any flower frogs? Do you use them to arrange flowers or do you have a collection on display? P.S. 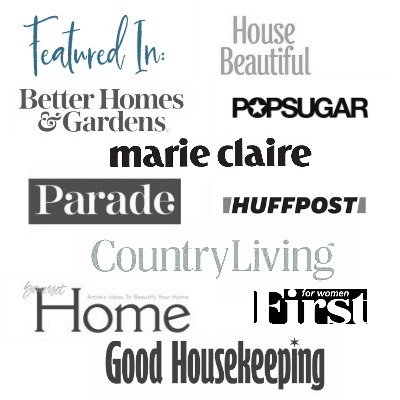 My friend Lisa was gracious enough to share some of her other garden-related collections and you can find them on this blog. 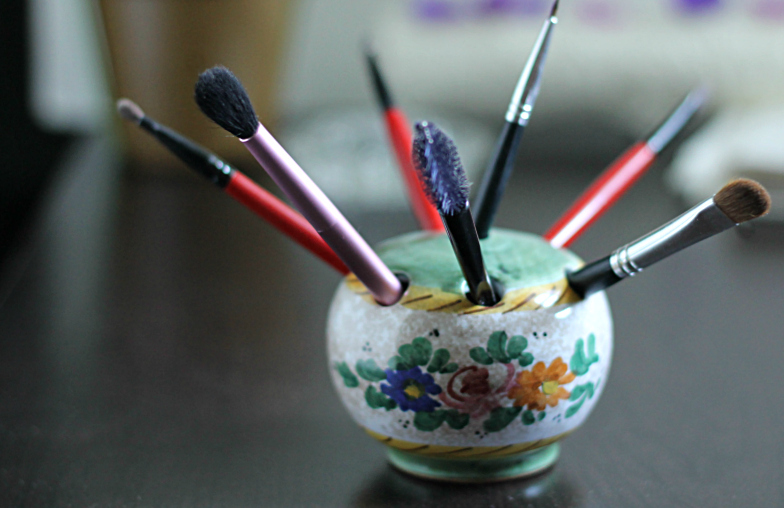 One is all about ceramic antique posy holders. The other is a set of vintage cigarette wildflower prints. Tiny little cards that used to come in cigarette packages back in the ’30s. They are so fun. Have you ever heard of them? That’s a fantastic idea. Thanks for sharing. I use mine to display my marbles. What a great idea. Some of the frogs would be perfect for a marble collection. i have a rather extensive collection of flower frogs. would be happy to share a photo or 2! My husband does not understand my love of these things, and to be truthful, neither do I! I cannot resist when I see them (even the most common clear glass ones) at a flea or tag sale. They have to come home with me. Gald to see I’m not the only one out there! Glad to hear from a kindred spirit. That’s what tag sales are for: collections! I would love to see your collection. hi I came across this page via Pinterest and found it interesting. I often see these frogs at charity shops but never pick them up generally ignoring them. 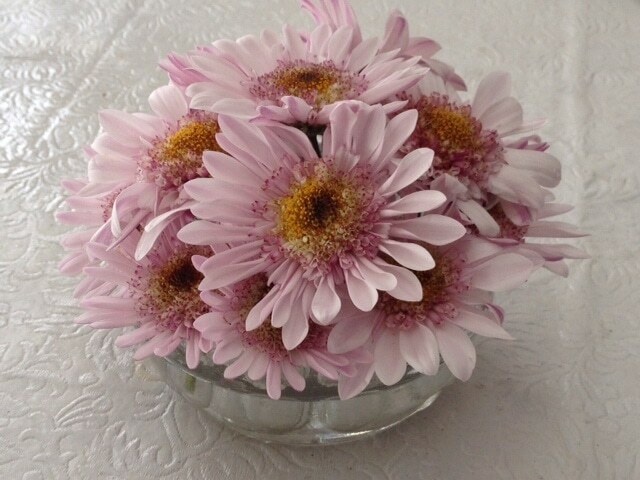 Having seen the lovely daisy display I think next time I will pick them up and start using. Excellent. Thank you Tracey. I really appreciate your comment. Flower Frogs are pretty interesting and practical too. Enjoy. Thank you for sharing this…I never knew where Frogs got their name…I am always on the hint for some but so far haven’t come across any. Love the frog frog….he’s too cute! Glad you liked it. The frog is too cute! I almost used it as the featured image but then I thought it was a little to unusual and might confuse the issue. Keep looking you’ll find them. Lisa has me looking for them too! We’ll have to start sharing our finds next. So glad you stopped by. Hope you have a great day! I just love that small flower frog and flowers in the teacup! 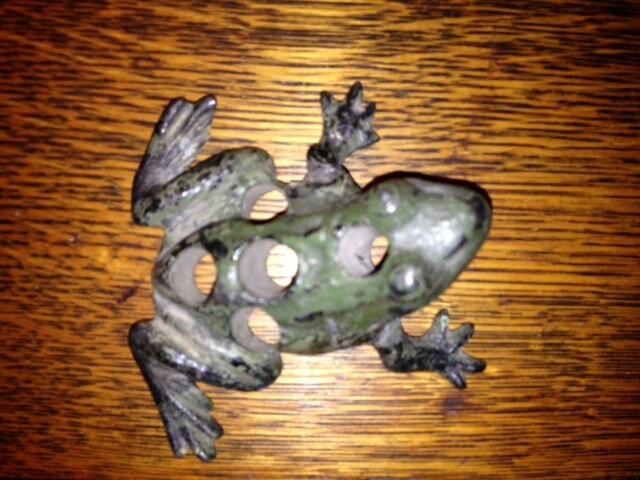 I have a friend who has an extensive collection of frogs, many of which were collected by her mother. I have asked her if I could show her frogs on my blog but we just haven’t gotten around to that. So I’ve started collecting a few of my own. My favorite ones are the glass ones. Thanks Jane. I’d love to see your friend’s collection. They are so cool. I’m keeping an eye out to start my own collection. Thanks for stopping by! I had no idea that flower frogs came in so many different types. I love the ceramic frogs but the figure frogs are so unique. The only ones I have ever seen are the metal pin cushion type. Of course now I need to have one. Just one more thing to be on the lookout for. Traci, I’m glad you like them. They are do fun and it’s always fun to have something to be on the lookout when you out antiquing or at the flea market. Stop back and show us your finds.